The Story of a Little Hero | People | Out of Sight, Out of Mind? As many will know, with the outbreak of war, Bart’s and Middlesex Hospital patients were evacuated from London to Hill End Hospital for treatment and aftercare. Bart’s were responsible for those with broken limbs and other conditions, whilst Middlesex carried out plastic surgery on patients who were either badly burnt or disfigured. This arrangement continued up until the 1950s, when my experience of being a patient starts. 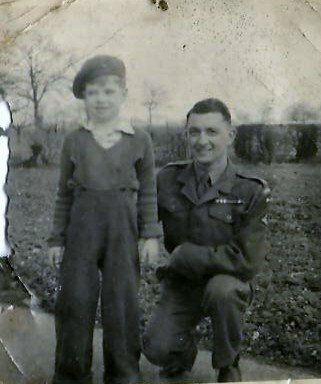 As a member of His Majesty’s Forces, I was shipped out to northern Italy and took part in the Anzio beachhead landing where, whilst under heavy shellfire, I was seriously wounded by a piece of shrapnel, which totally shattered my left elbow. A year or so after my discharge my elbow, which by now had become fixed, gave me a lot of pain, and so after consultation with Bart’s medical advisors, I was admitted to Bart’s (Hill End) for an arthroplasty operation. The object of this operation was to give me a working elbow, and was successfully concluded. The Ward FF2, which was an overflow of the orthopaedic ward FF1, was for medical conditions as well as damaged limbs. It was under the control of a fairly strict but very efficient staff nurse, and a number of junior nursing staff. During my stay, the ward received a new patient, a young boy of six years called Bobby Harpum, who had travelled with his mother from Bermuda, where his father worked. Both of his legs were totally deformed, added to which he had internal problems. It was decided that to enable him to walk he would need to have a bilateral operation and false limbs fitted. This was done over a period of time, including operative treatment to his intestines, which resulted in him having very bad bouts of both pain and trauma. He was a little hero whom everyone adored; such was his bravery, that he was entered as a candidate for an award in the Charlie Chester Radio Show, which was accepted and broadcast to millions of people. Bobby’s mother, who was stopping in Hertford, brought him over to St Albans to see me, and the sight of him running down the road (on his new legs) to greet me is a memory I will always cherish. Unfortunately I lost touch with them and can only presume they went back to Bermuda. This page was added on 27/01/2011. I have been contacted by Reg’s granddaughter today and after reading this story, can safely say that this is my dad mentioned in the story above. I’m so glad to hear that others referred to him as a hero and not only me, as his son. With the help of my granddaughter Helen, using Facebook, I have managed to contact and speak with Bobby’s son Matthew, who lives in Kent. He told me that Bobby died in 1994, confined to a wheelchair as he later suffered from Spina Bifida. His father died in the late 1990s, and his mother now lives in South Africa. Matthew has promised to keep in touch and also to send photos later of his father. Although I was saddened to hear of Bobby’s death, I was pleased to have been able to re-establish contact with his family.